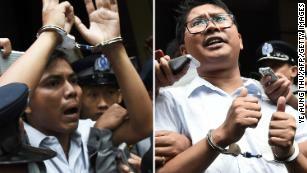 The reporting was “not just based on testimonies of victims, which are key and incredibly important, but it includes one after another stories from the people who actually did this, and in some cases were actually proud of what they had done,” Reuters Myanmar bureau chief Antoni Slodkowski told CNN late last year. In April 2018 seven soldiers were sentenced to “10 years in prison with hard labor in a remote area” for their part in the Inn Dinn massacre, where the victims were forced to dig their own graves the day before they were beaten, stabbed and shot to death. The Reuters reporting elicited the only admission of guilt from the Myanmar government, which routinely rejects criticism of the actions of its troops in Muslim-majority villages in the far west of the mainly Buddhist nation. 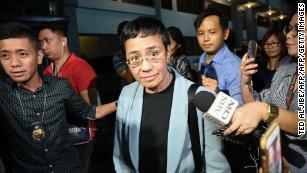 On Tuesday Ressa appeared in a Manila court to continue her appeal against a “cyber libel” charge brought against her organization, Rappler. The case is just one of 11 that Ressa and her staff face in what she says is a politically motivated attack on her ability to cover the presidency of Rodrigo Duterte. “This is not just about Rappler — it has very serious implications for anyone writing on the internet. And we will fight,” she told CNN. For last year’s laureate see: https://humanrightsdefenders.blog/2018/04/20/3-may-world-press-freedom-day-awards-for-journalists/. The award will be presented on UNESCO’s celebration of World Press Freedom Day in Addis Ababa on 2 May. Nicaragua’s human rights crisis see https://humanrightsdefenders.blog/2019/01/18/exceptional-response-by-international-ngos-to-human-rights-crisis-in-nicaragua/] has sent many journalists into exile. Among them is Wilfredo Ernesto Miranda, a young reporter for the respected Nicaraguan weekly newspaper Confidencial. Miranda came to Miami after being threatened with imprisonment for exposing the murders of protesters by pro-government forces in a May 2018 article titled “!Disparaban con Precisión – a Matar!” (“They Were Shooting Precisely – to Kill!”) “I was able to document close-range bullet wounds to the heads and throats of protesters that could only be execution-style shots,” Miranda told WLRN. The Rey de España prize is one of the most prestigious journalism awards in Spain and Latin America. Miranda said he wanted to dedicate his Rey de España prize – awarded by a jury in Spain – to imprisoned Nicaraguan journalists Miguel Mora and Lucía Pineda, who face terrorism charges that human rights groups call absurd. This Week In Asia, Rohingya: nowhere like home. Ismayilova, Azerbaijan’s top investigative journalist, was convicted of tax evasion in 2015 in what was largely viewed as a payback for her work. She was released from prison six months later after a higher court commuted her 7 ½-year sentence and converted it into a suspended one. She is not legally allowed to travel outside the country while she is still serving the sentence. Ismayilova petitioned the court several times after her release to be allowed to travel outside the country but all of her requests have been denied. In mere 17 seconds Khadija Ismayilova, Azerbaijan’s leading investigative journalist and ardent government critic, shows courage and optimism in spite of her arrest. On 5 December 2014 (a few days before Human Rights Day) the Sabail District Court of Baku sent Ismayilova to two-months of pretrial custody, pending investigation on charges of allegedly driving someone to attempt suicide.